It is an undisputed fact that as the world is moving towards a dynamic, digital age, consumers have taken to mobile means to get a service (or product), rate it online, tweet about it, and is dissatisfied, rant about it online too. They are used to getting what they want, when they want it, their expectations have risen accordingly. In fact, a global study by Conversocial revealed that customer-service interactions over Twitter increased by 250% since 2015 and that answering a social media complaint increases customer advocacy by 25%.. And here we are, slowly trickling down to an arena, where competition between brands is tight, and negative feedback goes viral at godspeed. Make or break your reputation! Now the products and services you offer are only as good as the service you back them with. 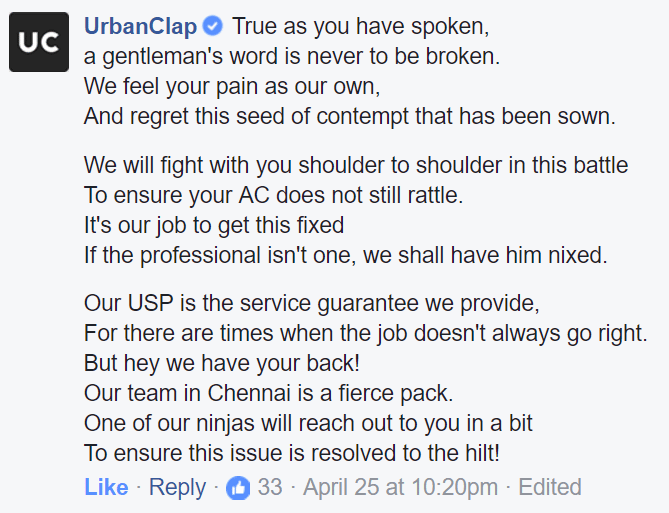 And this is what lifestyle service provider UrbanClap assured when a disappointed customer poeticized his concerns on the brand’s Facebook page. Surely, a chat that will appeal to all, especially the noble ‘poets’ sitting out there. And it goes on…You can find the full poem here. 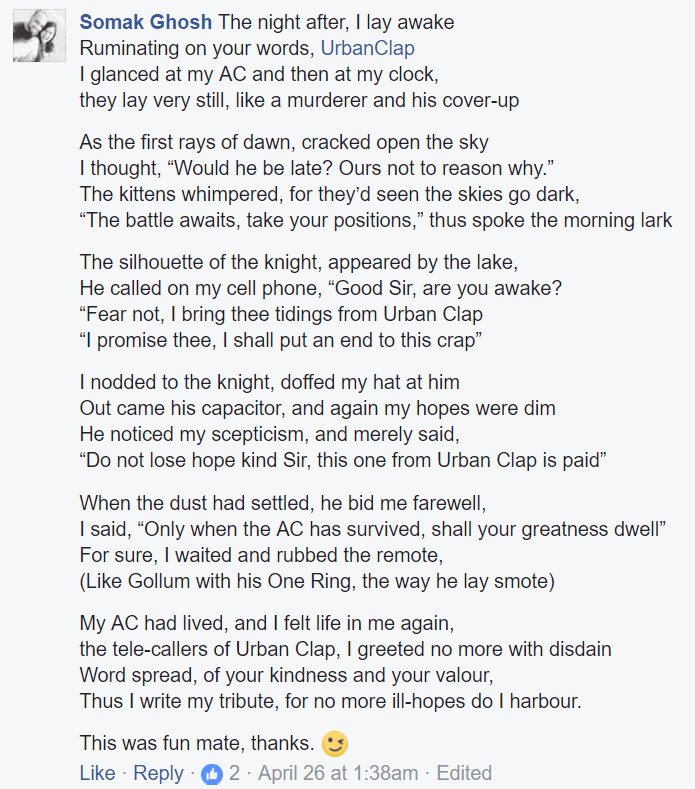 Now this was a long but ‘creative’ complaint by a frustrated customer who (may be) fell asleep as he watched his “AC’s dying lights blinking”. And mind you, it’s Chennai he is writing from, where summers get really harsh and sweatthirsty. 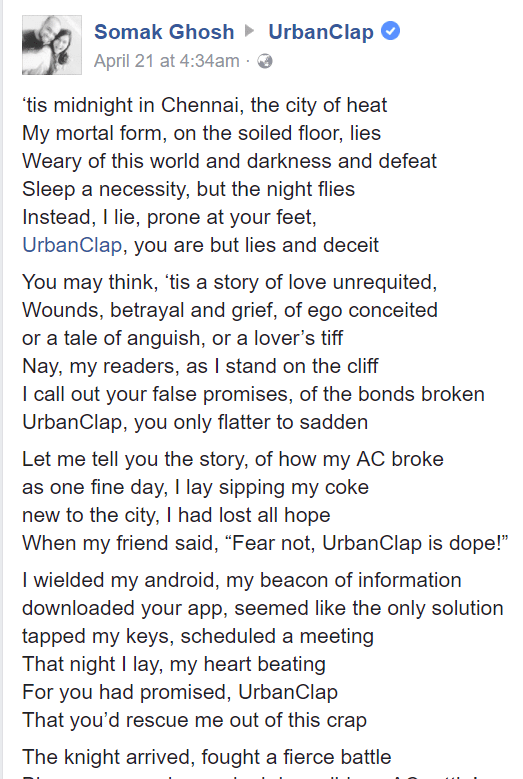 But before he could wage a war at Urbanclap (as he threatened in the poem), take a look at how UrbanClap tackled the creative urge of an aggrieved customer. Now this is ‘social media handled right’. A service availed should be just as easy to be rectified as it is to purchase it. Because if you make it difficult, you can be assured that the customer will be walking out with a “never again” bearing.